This post was originally published on 30th April 2015 . . . In February I changed the WordPress theme for this site. This started as a cosmetic gesture – I wanted it to be easier to read and easier to search. However, in the process, it has opened up new possibilities. At the moment, these possibilities are inklings at the back of my aging mind. Discovering them means teasing them out, being honest with myself about what I think I am doing . . . and why. First a visual link between the header and the new main menu. I am comfortable with this image. 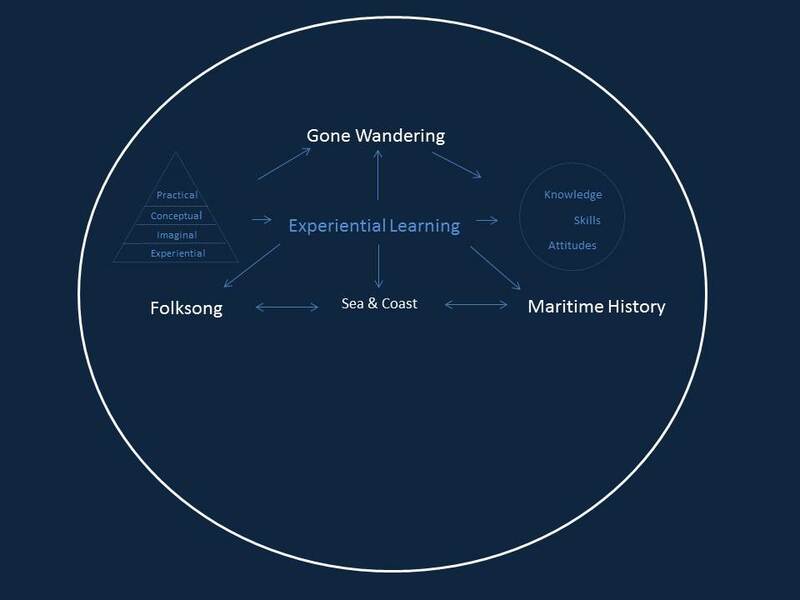 The ‘Folksong’ and ‘Maritime History’ elements are still there. The new ‘Gone Wandering’ element will give me the chance to write about new topics. However, at this stage it is still the cosmetic change mentioned above. My concern now is that I may not have the skills to carry the blog forward – I need to learn more, not just about the content, but also about the media involved – writing, photography, digital technology etc. This is a good point to review how l learn. As a young man, I needed guidance on a wide range of skills, together with the specific education and intense training required for my career. As a result, I spent much of my life in formal learning situations – obtaining professional qualifications, taking courses, attending seminars, reading textbooks, studying academic papers and so on. Now I am older, I have less time for such a defined approach. I appreciate a wider freedom to learn. Moreover, taking a passive approach – reading other people’s books and blogs, even taking courses of my choosing, while helping, will not be sufficient. I want to be more proactive. I would prefer that whatever learning I do now be self-directed, ‘on the job’, learning by experience. My original motive for starting the blog was research. I had bought a boat – a Folksong, about which I knew very little and I wanted to find other owners who would be able to tell me more. This proved to be a very fruitful approach. 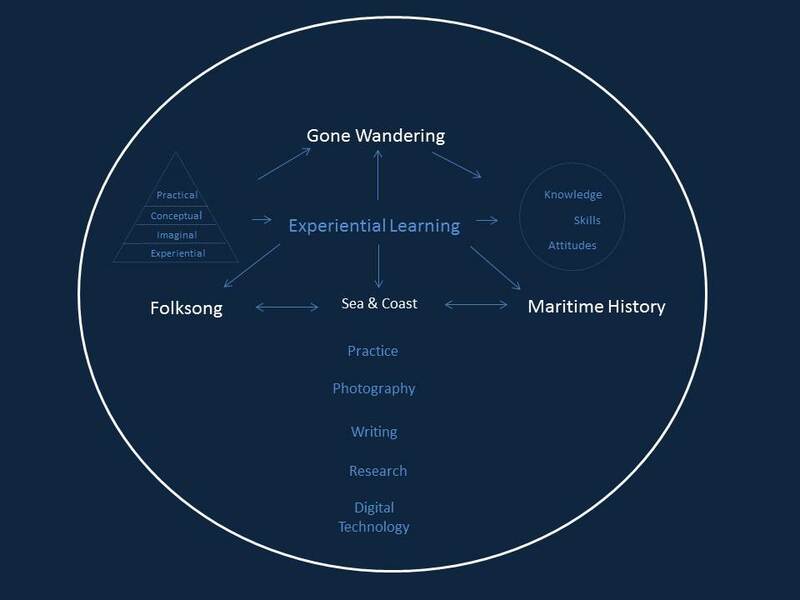 At the same time, I realised this was a useful medium for sharing photographs, information and stories about the niche in maritime history that my ancestors had experienced. This too proved fruitful. 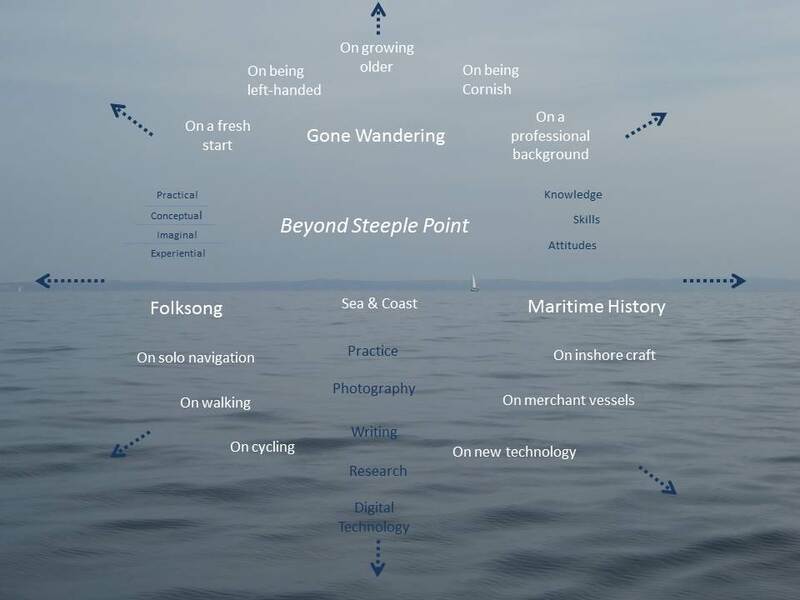 I am grateful to the people who have contacted me about my boat, and also those who have widened my knowledge of the merchant vessels of the Westcountry. My research is not over. There is still much I don’t know and I hope those contacts will continue . . . but, like Topsy, I am growing . . . 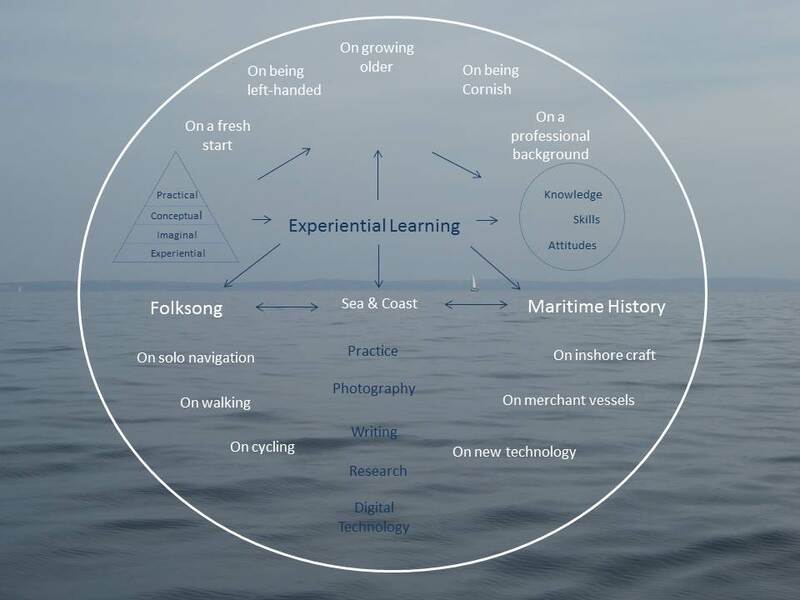 So if, as mentioned above, experiential learning is to be an underlying motive how does it fit into the new model I am building? I am not an academic, nor do I have a background in education. However, in the mid-eighties I was planning a change in direction in my career. There wasn’t an established route for what I wanted to do. There was plenty of well-meant advice but essentially it was up to me – I had to make my own way. So, while I sought new knowledge, new skills and new attitudes, I also looked for a simple learning model – a way of organising my thoughts, to help me achieve them. I became interested in the idea of ‘self-directed learning’, in particular John Heron’s model on the facilitation of such learning. Thirty years later I still find it relevant. (At this point I should note that in 1985 the internet was in its infancy and most of such research was still via books and academic papers. My introduction to facilitation was in this context. For the purpose of this post, I have extracted a little information from Heron’s books which were published later. The references are at the end of the post and, for a fuller understanding of facilitation, I encourage you to read them). In the meantime, it is worth spending a few moments studying this. In his model, John Heron suggests that what he refers to as Manifold Learning has “four interdependent forms . . .
Imaginal learning . . . This is the imaginative, intuitive, level of learning. Thus the model is dynamic. The visual effect, which I have not illustrated in my graphic, is of a spiral, lifting the person as he/she grows with the process. How often does a person find him/herself practicing the same task, the same way, time after time? This would be fine if the pinnacle of that practice has been reached and the person is satisfied, but what if it is less than good enough and they are dissatisfied? Is it possible to change the experience by taking an element within the model, re-imagining it and kick-starting change? This is the point at which the process becomes intentional. It is a way of examining one’s relationship to a situation. By continuously re-examining that relationship, the learning cycle can be used as a practical tool for change. But there is a caveat – a be(a)ware. In my forties, I thought I had completed my apprenticeship in life. I had a family and a career. I knew where I was headed. It was a particularly productive period for me, I used the model to lift my experience, make successful changes and move on. Now in my late sixties, I find that life is still an apprenticeship. The ‘maturing’ of my experience has merely created new situations. I am no longer confined by a career. I am free to wander a wider path, where the destination is less clear. However, within that greater freedom, I am aware of a current carrying me in a certain direction and that there are situations that restrict as well as ease that progress. The learning cycle no longer guarantees a widening in knowledge, skill or attitude. Elements within that vast ocean of online information that we all have access to can get in the way, clogging up the learning process. That does not mean I should ignore it, but nor does it mean I should allow myself to get bogged down by it. There is an old joke about specialisation – “knowing more and more about less and less until you know everything about nothing”. Thanks to our ability to surf the internet, the opposite also applies – “knowing a little about a lot but not much about anything in particular”. There is a fine balance to be struck between the two. Part of the aim of this blog will be to help find that balance. The primary tools for learning on this job are the ones visible on blog posts – writing and photography. The writer and photographer learn as they go. It’s the doing – the practice, rather than the talking about it that makes both the artist and the artisan. We – well, I at any rate, spend a great deal of our lives getting ready to get ready without actually achieving anything because a) we are always looking at background theory – (yes, you’re right, this is what I am doing right now), and b) we don’t finish what we start. Practice has a beginning, a middle and an end. Do it, do it again, become competent, move on. Neither my writing nor my photography is as yet up to the standard I am seeking but both are better than at this time last year. Research is also important – preferably physically out there listening: eyes, ears and nose open, hands alive, mouth shut. 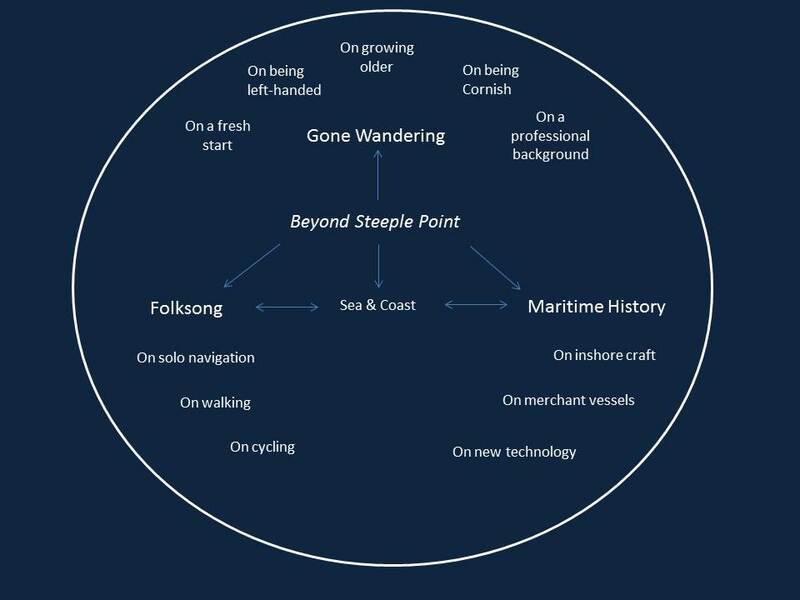 The greatest pleasure for me is in being at sea, exploring ports and harbours and walking the coast; and noting the experience of others doing the same. This is not to underestimate the need to study – to spend time online, in books, searching museums, libraries and galleries. The object is to channel the flow of information productively, backing-up experience. The final tool is digital technology. In previous posts I have been critical of digital technology because, at its worst, I see it as crushing experience gained in the pre-digital ages. At its best, digital technology can be immensely beneficial in enhancing the building blocks of humanity – the intellectual, the emotional, the practical and the spiritual, and in raising our collective experience to a higher level. Generation after generation have learned lessons from life that we can use to face challenges that are rapidly closing in on us. However, digital technology’s ease of use and the rapidity with which it can grab attention is also being used negatively, (notably in current wars, identity theft, cyber crime but also more subtly in misused social media), dragging us backwards into an age we should have grown out of, distracting us from the greater challenges of the modern world. I have posted on most of the topics above but more randomly than the graphic implies. I realise I know a lot about some of these topics and a lot less about others – and none of them do I know everything about, which puts me in line with everyone else. But I am interested in all of them and my interest will deepen and grow. Looking at this for the first time, I wonder at its neatness, its tidiness, its arrows and lines and barriers – a reminder of my professional background. The image is inward-looking, a vision of the blog from the writer’s point of view. Its value is in my not losing sight of what I am doing. I will know which future posts fit into this assembly and will have a feel for those which take me in a new direction. So, with the benefit of digital technology, in just a few seconds it changes it from the above to . . .
6. The final tweak . . .
At 15.29 on Wednesday 29th April 2015, this is as accurate a view of the blog as I can currently produce, a view that I am happy with, a view that has strengthened my resolve to continue blogging. Therefore, the result of this exercise is a working concept: the blog is an extension of my later years – a vehicle running alongside my ‘growing older’. 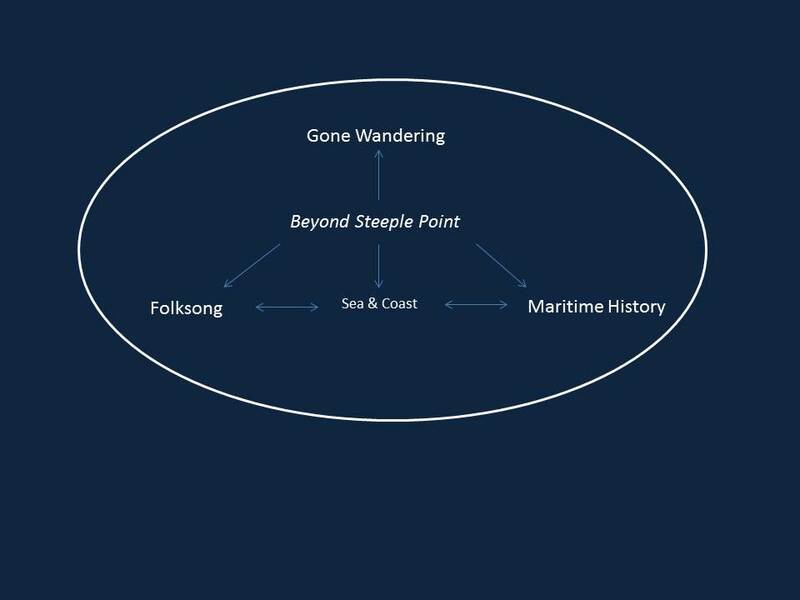 I will continue to write and to photograph ‘as and when’, keeping the nautical theme and taking it forward by drawing on the past (Maritime History), learning in the present, (using my Folksong as a reference), and re-imagining the future, (Gone Wandering). The task now is to practice – write more posts, take more photographs, learn from the experience . . . This is the point in the cycle which asks whether what has been written is what the reader reads, or, rather, whether what the writer thinks he/she has written is what the reader thinks he/she has read. From the tension between the writer’s writing and the reader’s reading, new concepts arise. We have looked beneath the surface of the blog, but only to a certain level. This post is not directed at the person behind the person writing the blog, but at the blog itself. If we were to take it deeper to look at the writer, we might think in terms of the intellectual, the emotional, the physical and the spiritual – the building blocks of being human mentioned above, and, while I acknowledge that these are elements within all of us, (and can be related to in the learning cycle), exploring them here would be outside the purpose of this exercise. They occupy a domain best illustrated by the Great Writers, Poets and Composers. The writing of this post has been more than usually personal and as such is important for me because it is precisely the type of learning experience I am seeking, and I hope useful for you for a similar reason. Could I have performed it quicker on the back of an envelope? Possibly, but envelopes are not the medium I am using. Finally, it is important not to get too hooked on this. This has been a snapshot of the blog as it is today – a waypoint from which to move on . . . I have contacted John Heron who has kindly approved the references I have made to his work. The WordPress theme is Hemingway Rewritten.